Be cautious of scams. There have been numerous attempts by fraudulent straw buyers. Visit Maine Attorney General’s site for notices. CURRENT Sellers: Email us with updates or when sold out. Need Straw? Visit the Maine Straw Directory. www.hayforsaleads.com; Not affiliated with UMaine in any way. Listed alphabetically by County, then Town. Information for Maine is followed by other states, then Canada. Androscoggin April 2019 First crop hay will be available starting in June. Quality hay @ $3.50per bale off the wagon and $40 for 4×4 round bales that I can load in the field. Stored hay is $4 per bale and $45. Second crop will be ready in July and August @$4.50 off the wagon and $50 for round. Mulch hay, square bales only $3/bale if picked up at the farm, $4/bale delivered! Both composed of mixed grasses from multiple fields in Minot. Free delivery within 40 miles, further delivery can be arranged. Androscoggin July 2018 2018 Hay square and round 4×4 bales we do a excess of 65.000 bales a year on fertilized soil tested fields our hay is guaranteed to your Satisfaction delivery Available in 500 bale loaded. High quality haylage in 2 bunker silosQuantity discounts available!20-25 acres of standing corn also to be sold! Arrange pick up at farm.We have consistently produced quality feed for dairy for almost 100 years! This feed is produced on fertilized, soil tested fields. Past winner of the Maine Farm Days quality forage award!! Waterman Farms Inc.
Androscoggin August 2018 Horse quality first and second cut square bales of mixed grasses from fertilized fields. Aroostook December 2018 We have horse quality small square bales of hay delivered anywhere in New England! Please call for details. We also offer premium clover baleage excellent for dairy cows or deer. Delivery available anywhere in New England! Aroostook September 2018 Timothy 4×4 foot rounds, average 565 lbs each. Net wrapped and under cover since baling. Also have mulch and straw. Cumberland September 2018 Have early summer round bales for sale. 4×4. Dry. Covered. $40. Hancock August 2018 Square Bales in field $4 a bale, 4 x 4 1/2 Round Bales in field $50 in field, Mulch Hay in field $3 a bales. Kennebec August 2018 Horse quality timothy mix hay. Square bales. Second cut. Call for pricing. Kennebec August 2018 Timothy and clover. Quality is excellent. 30 lb+ square bales – limited quantities 1st crop. Kennebec September 2018 $4.00 for square $40 for 4×4 round, all in barn. 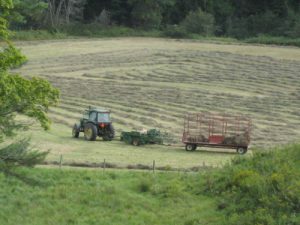 Oxford August 2018 MOFGA Certified Organic Hay – 5 foot rounds or small squaresIn the barn near Bethel Maine. Oxford February 2019 Hay. Square bales off fertilized, healthy fields. No chemicals or ag fertilizer. Tight bales moisture tested when baled, good weight. 1st cutting $4.50, 2nd cutting $6.00. We moved 2000 small square bales this year! Piscataquis December 2018 Second and third crop hay available in barn. Good color, weed-free big bales at a fair price. 2018 First cut hay $4/bale out of the barn. Second cut hay $4.50/bale out of the wagon, or $5/bale out of the barn. Call or text for availability. Fields are organically managed, without certification. Somerset December 2017 Horse hay square and round timothy and native grasses. Somerset August 2018 Timothy, Clover and Orchard Grass mix, large tightly packed square bales. First Crop $4 a bale, Second Crop $5.50 a bale. We’ve had very positive feed back from horse and goat owners! Our dairy goats absolutely love our hay! Somerset December 2018 No longer have 4×4 round bale dry hay. 4×5 round dry hay mostly spoken for. few 4×4 wrapped silage bales 2nd crop $50. Good quality forage hay for sale. Also mulch hay. 45 to 50 pound square bales. We do not deliver hay. Email or call for availability and pricing. 40 lb square bales in 1st 2nd or 3rd crop. 3x3x8 big squares in 1st 2nd or 3rd. 4×4 round bales in 1st crop. 3x3x6 baleage in 3rd crop or oatledge. Bagged oats sold by the ton. Straw: small squares, 4×4 rounds or 3x4x8 big squares. 800 ton of corn silage. Loads are sold by the 18 wheeler load. Delivery to anywhere in New England or anywhere on the east coast including southern states. Please call 2074009674 Marshall. Waldo August 2018 We have a good supply of this years 1st cutting hay. This is early cut, green, well packed bales and smells great, Your animals will love it. We also have a good supply of 2nd cutting hay available. This usually does not last long. We also guarantee quality. 2018 hay in the barn. May still have hay available on the wagon . Hay in the barn is $5.50 per bale. York August 2018 Feed hay grown in New Brunswick, Canada. We deliver in ME, NH and MA. Timothy feed hay is available by the bale, round silage, round dry cow, or round dry horse bales. Quoted pricing is based on quantity and distance with shipping included.